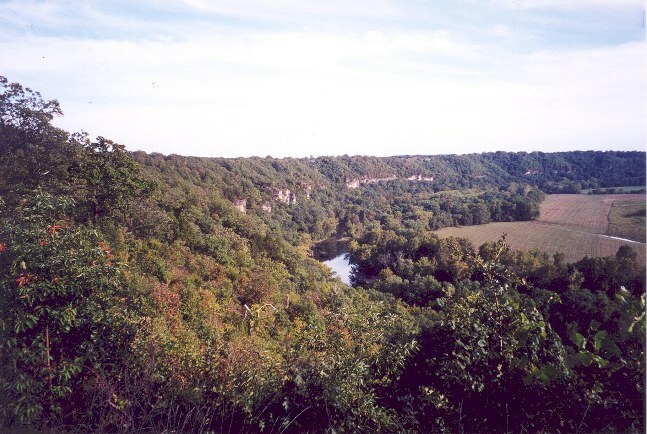 The Clifty Creek Natural Area, which is administered by the Missouri Department of Conservation, is home to Clifty Creek and a natural bridge. Clifty Creek flows through a small canyon in places. 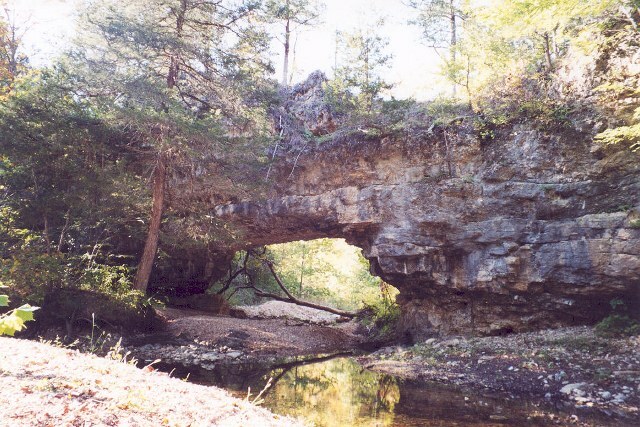 The Clifty Creek Natural Bridge is quite scenic and spans a small tributary of Clifty Creek. The area is pretty all times of the year and some like to visit in the winter, as the area is much less overgrown. Both the creek and the natural bridge are scenic and popular among photographers even though they are relatively remote. 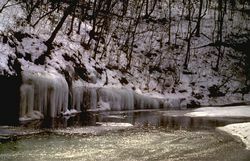 The Clifty Creek Natural Bridge was formed when Little Clifty Creek, a tributary of Clifty Creek, undercut a drainage divide and was pirated by Clifty Creek. It is likely that a cave or joint (fracture) in the rock originally served as a shortcut under the rocky ridge and was later enlarged to form the natural bridge. It also appears that the same rocky ridge was once home another natural bridge just downstream. Those who climb atop the ridge and walk in the downstream direction will notice that the ridge ends abrubtly at a steep dropoff with large boulders below. These boulders are likely the remains of another natural bridge that has since collapsed. 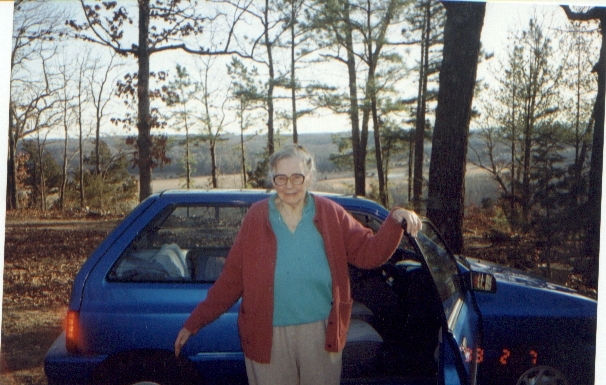 Clifty Creek wasn't too far from our house and we often went there (all five of us including Helen) on picnics. One day Helen decided it was time for me to learn how to swim. So she called me over to where she was standing in shallow water. The next thing I knew she lifted me up and tossed me about five feet away from her in the deep end. Well,that was my first swimming lesson, and guess what every time I tried to get to land Helen blocked the way. Finally, after I was managing to stay afloat and was sputtering water, she relented and I passed my swimming lesson! 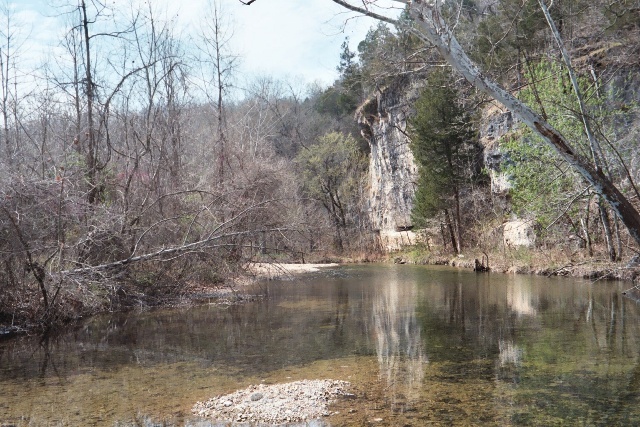 I had learned how to swim in one of the most beautiful creeks in Missouri. CLIFTY CREEK. It's still there today. Take Hwy 17 north from Shriners around a mile to I-44. Turn right and head east to the Highway 28 north exit (exit 163). Turn left and cross I-44. Pull into the green Voss Express Filling Station where one can purchase gas, food, and use the restroom. From this point, head north past Dixon, MO and turn right onto Hwy W, which is approximately 13 miles north of the Hwy 28/I-44 interchange. Follow Hwy W until it turns to gravel and proceed around a mile past the parking lot for the Clifty Creek Conservation Area, which is on the left. After passing under large power lines, pull over near a fire road that has been blocked by several small, short wooden posts and some large rocks. This access point, located on the left side of the road, is shortest trail to Clifty Hollow and its natural bridge. It is quite rugged and strenuous by Missouri standards so those wanting to take it easy may want to park at the parking lot and take the slightly longer but much less strenuous hiking trail. Follow this trail and bear right as it heads down the hill. The trail will join the creek almost right at the bridge. This point makes for an excellent viewing area of the bridge as does the vantage on the other side of the bridge. To get to the overhanging cliffs, one can either walk about one half mile downstream or drive farther down the road and park near the next low water crossing, which also offers a scenic view from the road. Simply walk upstream less than one-quarter mile to the cliffs. Be aware that the hiking of steep hills is involved and the area could be dangerous if one were to slip. Also, be aware that some of the land adjacent to the creek is private property. No Trespassing; signs and purple/pink paint on the trees mark the private property. 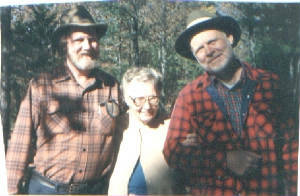 Much of the Pioneer Forest, which contains Clifty Creek is actually privately owned by Leo Drey and the LAD Foundation. The LAD Foundation promotes conservation and outdoor recreation by preserving land their land while allowing public use. Many of their lands are administered by other agencies such as the Missouri Dept. 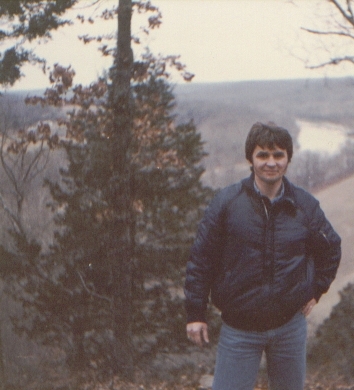 of Conservation (MDC) and the Missouri Dept. of Natural Resources (DNR). While on the way to or from Clifty Creek, one may want to visit Portuguese Point. Portuguese Point is located just off of Hwy 28 on the left side about five miles south of Dixon. Portuguese Point is a rock promontory overlooking the Gasconade River. The river divides below the point and the bluffs are around 250 feet tall at this location. From Portuguese Point, one can look out for miles and see the river, forests, and farm fields. The area was originally named for Portuguese farmers who once raised cattle and sheep in the valley below. This scenic overlook can be reached from a pull-off along the road or from the Point Steakhouse, a restaurant with a very similar view. Diners at this restaurant are provided a scenic view of the Gasconade River Valley. Ralph Burgess how to SWIM! 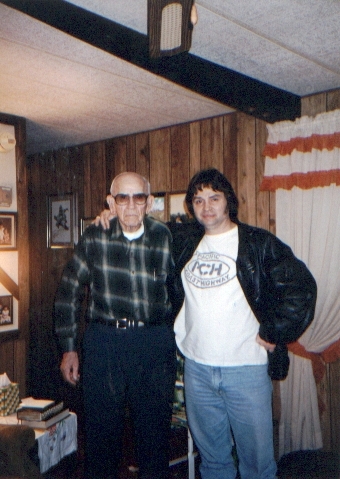 IN 1993 I also met up again with Arnold Bassett. 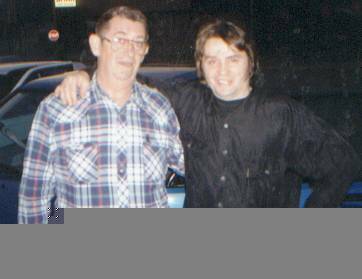 The same Arnold who had hunted me down in Waynesville, Missouri after I ran away from Helen Burgess after a good beating! When Arnold saw me in the town he chased after me and took me to a restaurant and bought me a hamburger. I tried to tell him that Helen would kill me if he took me back there and even showed him my lumps and bumps. Arnold said that everybody was missing me and worried about me and he was going to take me back there after we ate. As we drove down Highway 5 past Hayden Store, he asked me if I wanted an Ice Cream. That's when Hayden Store came to my rescue and Arnold was forced to go back home without me! Arnold was our next door neighbor and lived with his dad Clyde and mom Faye, and brother Roy and sister Marilyn about a half mile across the fields from us. Roy Luke Bassett would one day take the place of Willard Shockley as Sheriff of Maries County, Missouri. Ain't Life Strange? 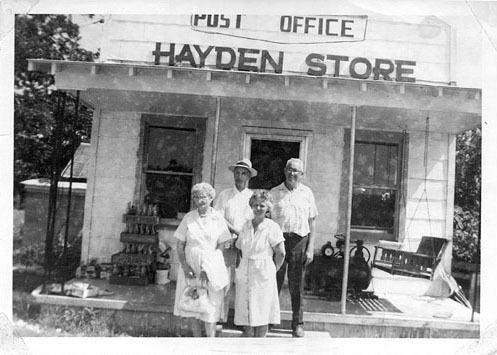 Standing on the porch of Old Hayden Store (above) I couldn't believe just how small it was. When I was a boy of nine it seemed so huge! That was in 1960, and this was 1988. The building still stood and the sign was still atop it, but it was not a bustling post office or grocery store, seen after by a smiling person in the form of Catherine Hayes, the then proprietor. Catherine pictured opposite front was a gentle good looking woman and I attended the local Hayden Heights elementary school with her daughter Patsy. Nevertheless, I was glad my friend James Herndon from Sunrise Beach Missouri, had driven me up here and was taking this photograph for posterity, as who knew how much longer the building would stand. 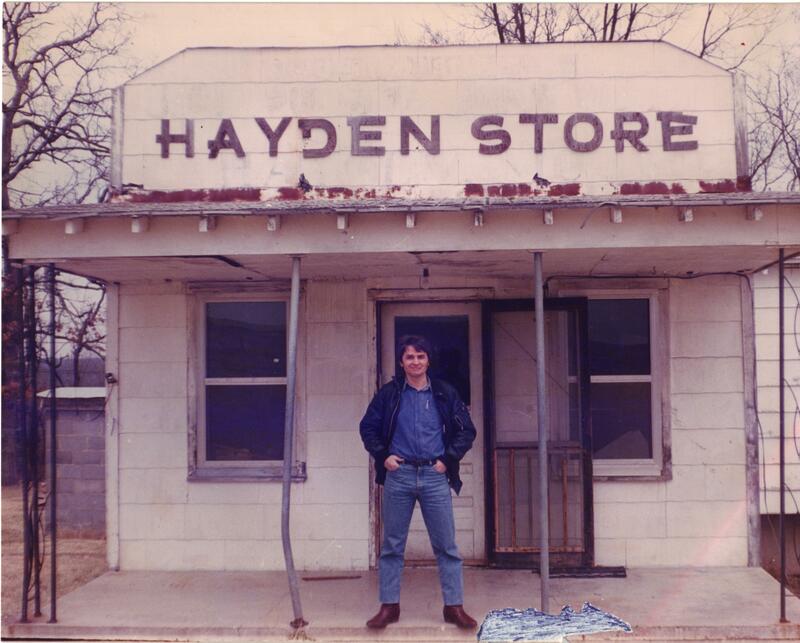 I was on a visit from London, England to experience first hand what Maries County and Hayden Store looked like after 28 years of local history. This was the small country store that would leave a lasting impression upon my mind and leave me forever grateful to Catherine Hayes for literally saving my life when I was brought in her store by Arnold Bassett on a hot day in July 1961 for an ice-cream cone. 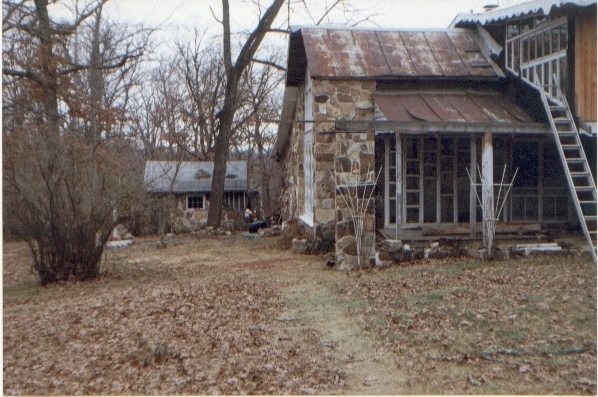 I had just run away from home about three miles down the road and had made it all the way to Waynesville, Missouri. That's where Arnold Bassett our neighbor had found me. Just as we passed Hayden Store Arnold asked me if I wanted an Ice Cream and I sad YES! When I walked in the store Catherine Hayes asked me "why did you run away Ralph". I said, well have a look at my back, legs and lumps on my head, which she did. After having seen by bruises she said to Arnold, "I can't let you take that boy back home, I'm calling the Sheriff.! Well Sheriff Willard Shockley came to Hayden Store picked me up and took me back to the Vienna Prosecutor's office, and that was the end of our life of hell at the house at the end of the driveway called The Burgess House on Maries County Road. 07/12/07 - Added new photos to Vacation Album page.